The goal of these pages is to allow PIs to understand enough of the instrument's capabilities, expected modes, performance etc. to propose projects which could be accomplished with the instrument given its anticipated performance. We provide some detail on the instrument's internal configurations but mainly concentrate on performance aspects. If in any doubt when writing a proposal, please contact the instrument scientist. The instrument is at the last Commisioning stages and thus the actual performance is lower than the expected theorethical values for now. Any user of the instrument should check the latest news on the performance on the Status and Availability page with details on Instrument Performance page. The team is regularly updating the performance data as soon as the data are processed, by subscribing to the GPI News Email Exploder a user can be kept updated as any changes occur on these pages. GPI is an extreme adaptive-optics imaging polarimeter/integral-field spectrometer, which will provide diffraction-limited data between 0.9 and 2.4 microns. The system will provide contrast ratios of 10^6 on companions at separations of 0.2-1 arcsecond in a 1-2 hour observation. The science instrument will provide spectroscopy or dual-beam polarimetry of any object in the field of view. Bright natural guide stars (I<9 mag) are required for optimal performance of the GPI adaptive optics system. GPI will be capable of detecting point sources down to H = 20 mag., with ≥ 5-sigma, in 1 hour (absent photon noise from a bright companion). For more information on achievable contrast, see the Contrast Page. The adaptive optics (AO) system, responsible for fast measurement of the instantaneous wave front, and for providing wave front control via two deformable mirrors. The calibration unit (CAL) is a high-accuracy infrared wave front sensor tightly integrated with the coronagraph. It provides precise and accurate measurements of the time-averaged wave front at the science wavelength and coronagraph focal plane, to suppress persistent speckles caused by quasi-static wave front errors in the final image. It also provides pointing and focus sensing to keep the target star centered on the coronagraph with 1mas accuracy and slow low to high-order aberration corrections. The coronagraph uses a combination of apodized masks and focal-plane stops to control diffraction and pinned speckles. The integral field spectrograph produces the final science image, including simultaneous multiple channels to suppress residual speckle noise in the spectroscopy mode or polarimetric imaging allowing the determination of the four Stokes parameters. 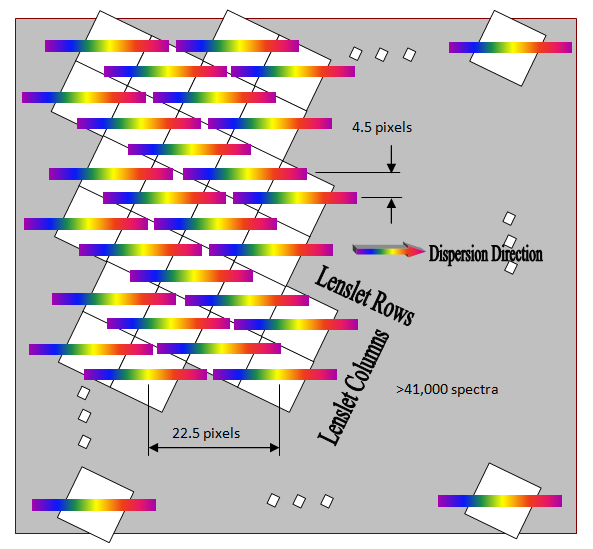 The primary data product of the IFS is a data cube consisting of slightly more than 200x200 spatial locations, each with typically 18 spectral channels in spectroscopy mode and two spots in each positions for the polarimetric mode. The final field of view (FOV) is 2.8 arcseconds on a side, with 14 milliarcsecond sampling. A figure showing the expected format of data on the detector is given here. The Instrument Scientist for GPI is Fredrik Rantakyrö.